In order to perform automated surveys we first need to have some questions to ask. For your convenience, this application's repository already includes one survey that can be loaded into the database. If the database is configured correctly this survey will be loaded each time the app starts. We want our users to have a way to take this survey, so we still need to implement a handler for SMS and calls. First, let's take a moment to understand the flow of a Twilio-powered survey as an interview loop. The user can answer a question for your survey over the phone using either their phone's keypad or by speaking. 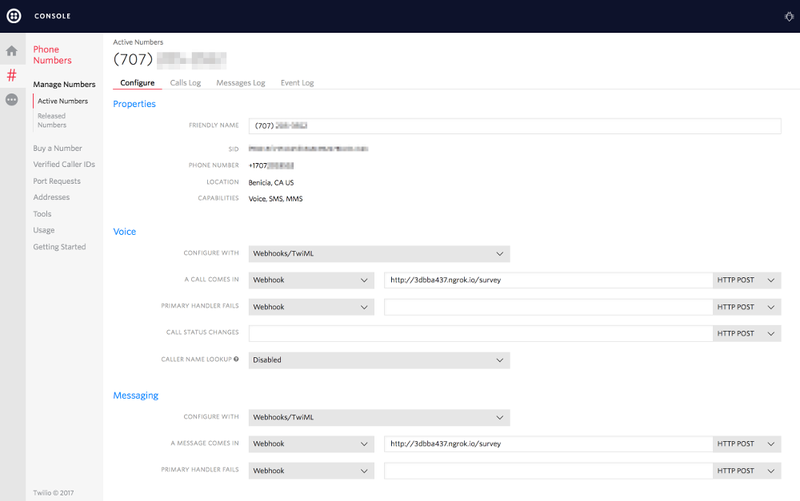 After each interaction Twilio makes an HTTP request to your web application with either the string of keys the user pressed or a URL to a recording of their voice input. You've configured your webhooks in the Twilio Console. Let's learn how to handle requests to our Twilio endpoints. Right after receiving a call or an SMS, Twilio sends a request to the URL specified in our phone number configuration (/survey/call for calls and /survey/sms for sms). Each of these endpoints will receive the request and will use a TwiMLUtil to return a welcome message to the user. For voice call users, the message will contain a Say verb with the message, whereas if the user is interacting with our survey over SMS, the message will use a Message verb. We will also include a Redirect verb pointing to the question's endpoint in order to continue the survey flow. We've seen how to handle requests to our webhooks. Now let's respond to some messages. This endpoint will check to see if our inbound request is an SMS or voice call, instantiating the proper class to build the correct TwiML response. Each type of question and interaction (Call or SMS) will produce different instructions on how to proceed. For instance, we can record voice or gather a key press during a call, but we can't do the same for text messages. When the user is interacting with our survey over SMS we don't have something like an ongoing call session with a well defined state. It becomes harder to know if an SMS is answering question 2 or 20, since all requests will be sent to our /survey/sms main endpoint. To solve that, we can use Twilio Cookies to keep track of what question is being answered at a given moment. This is done with the createSessionForQuestion method. Next, we'll see how to build TwiML to handle responses to our survey questions. If the question is "numeric" or "yes-no" in nature, we need to use the <Gather> verb. However, if we expect the user to record a free-form voice answer we need to use the <Record> verb. Both verbs take an action attribute and a method attribute. Twilio will use both attributes to define our response's endpoint as a callback. This endpoint is responsible for receiving and storing the caller's answer. We've seen how to generate questions with TwiML. Now, lets see how to handle the responses. After the user has finished speaking and pressing keys, Twilio sends a request telling us what happened and asking for further instructions. At this point, we need to recover data from Twilio's request parameters (ResponseParser does this) and store them with our persistResponse method. Body contains the text message from an answer sent over SMS. TranscriptionText contains the text of a voice recording. Finally we redirect to our Question controller, which will ask the next question in the loop. This is done in the redirectToNextQuestion method. Now, let's see how to visualize the results of our survey. For this route we simply query the database using a JPA query and then display the information within a Mustache template. We display a panel for every question in the survey, and inside each panel we list the responses from different calls.